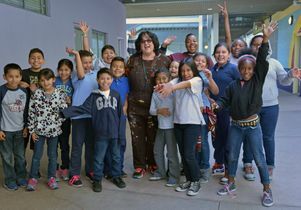 Professor Judy Baca’s Emancipation Project brings arts education to the Watts school named after her. Muralist Judy Baca is known worldwide for her community-building creative aesthetic. She’s revered locally in part for her epic and ongoing project, “The Great Wall of Los Angeles,” a series of richly illustrated murals that line a concrete section of the Tujunga Wash and tell the history of the city — her city — decade by decade. But for Baca, there are many great walls, especially those watching over students attending the elementary school that bears her name. The Judith F. Baca Arts Academy stands five blocks from where Baca was born in Watts — an area of Los Angeles where recent citywide arguments about gentrification don’t echo. But within the walls of the academy, the Emancipation Project is developing. For the last four years, Baca, UCLA students taking her “Beyond the Mexican Mural” course and artists from the Social and Public Art Resource Center (SPARC) have worked with sixth graders at the school to turn its walls into a living museum. The academy opened five years ago as part of the Los Angeles Unified School District. Baca discovered it was her namesake only after the fact, and ironically that it lacked an arts curriculum. Baca envisioned the building’s gray walls, which extend into sweeping swaths of concrete shapes, as a canvas for colorful stories of life and dreams, her specialty. Each year the Emancipation Project involves 20 to 40 sixth graders, many of whom are poor, undocumented, in foster care, have language barriers or struggle with traditional teaching models. Under Baca’s guidance, these students create aspirational portraits of themselves — holding gavels as judges, in front of microphones performing on stage, wearing lab coats and police badges, competing in sports, even wielding magic. 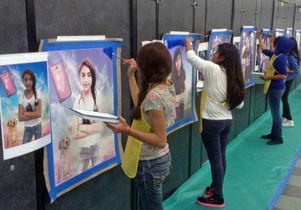 Once their portraits are complete, the images are mounted on the walls of the school’s outdoor cafeteria, where faces of dreamers that have come before watch over the current student body. 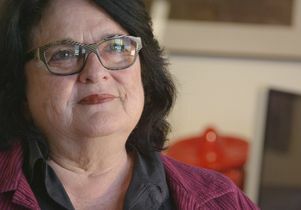 This year is the 20th anniversary of the UCLA@SPARC Digital Mural Lab, a multimedia studio and learning environment that functions in collaboration with Baca’s Venice-based SPARC, the public arts institution she founded in 1976. The Emancipation Project starts with Baca’s UCLA students, who come from myriad disciplines. Baca asks them to build a digital self-portrait that encompasses their ideas about identity. Baca and her SPARC team teach them how to use software and painting tools. Then the UCLA students transfer that knowledge to the sixth graders, first talking to them about their dreams, then creating digital collages that incorporate each student’s unique vision. Finally, the young students apply paint to poster-size canvas printouts, further enhancing the portraits’ dreamscape quality. Judy Baca on how she honored Kennedy’s idealism in two murals at the school complex named after him. Some of the UCLA students share a cultural background with the academy students they mentor, which forges trust. They all share stories and hopes in an earnest dialogue. 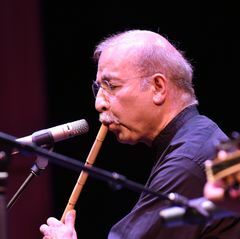 It’s a wildly different experience from any other UCLA course, and one the students involved said is inspiring and empowering. For art history major Kevin Michini, what emerged was a sense of legacy — learning the legacy of famous Mexican muralists, diving into Baca’s legacy and understanding his role in a powerful legacy of community. Each UCLA student works with three or four sixth graders, like Andres Ramos Robles, who proudly revealed he is the third child in his family (his brother and cousin came before him) to create an Emancipation portrait. 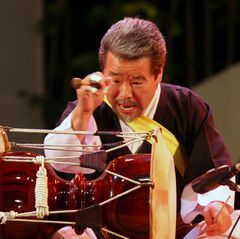 In his, he wears a stethoscope and floats against a starry backdrop. He said he wants to go to UCLA, become a doctor and research how to cure diabetes and cancer. “If I cure the planet of cancer I will become the doctor of the universe,” he said. Baca and students at the Judith F. Baca Arts Academy in Watts. 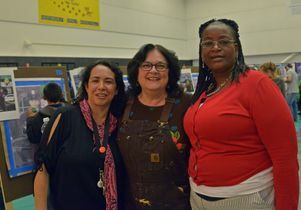 This year, thanks to a $79,000 grant from the Los Angeles Unified School District, Baca expanded the scope of the Emancipation Project, incorporating UCLA Chicana and Chicano studies professor and fellow muralist Martha Ramirez-Oropeza to work with kindergarteners on choral poetry; UCLA doctoral candidate Silvia Rodriguez Vega, who led sixth graders in writing and performing a play about immigration; Chilean artist Jacqueline Fuentes, who worked with 300 students to produce a singing program, and UCSD graduate multimedia artist Elaine Raif, who helped fifth graders make one-minute biographical movies. On June 9, the students presented their projects in a ceremony for parents and students. The effects of the Emancipation Project are vivid and immediate, said principal Tracye McWhorter and teacher Lorena Valenzuela, who was instrumental in getting the school named after Baca and getting Baca involved. Students really come out of their shell, especially ones who are struggling to learn English, McWhorter said. 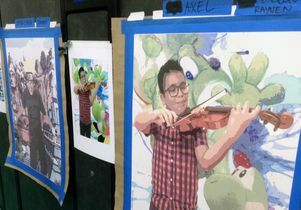 Baca and people at SPARC hope their work will serve as a pilot program that LAUSD might use to incorporate more arts education, especially for young learners who thrive under visual and kinetic opportunities. 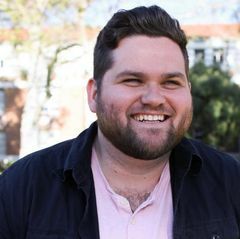 The UCLA connection is critical for this, said Farhad Akhmetov, system administrator for the UCLA@SPARC Digital/Mural Lab, as it provides teaching artists through collegiate courses and provides one-on-one teaching by UCLA student mentors. When they run out of wall space at the academy for individual faces, which is imminent, Baca hopes to shift the focus of the project into a communal narrative work, which would allow more academy students to participate. 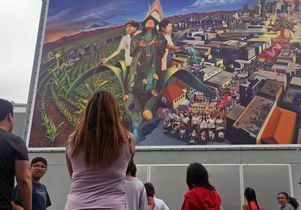 The mural “Gente del Maize” features a student Baca taught at UCLA and serves as an inspiration to the kids at the Judith F. Baca Arts Academy. Meanwhile, Baca and her team are filling many of those inviting gray shapes of the campus walls with earlier Baca works. 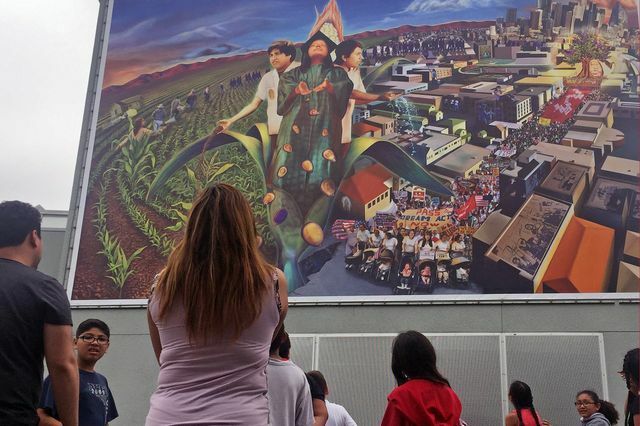 They recently installed a reproduction of “Gente del Maiz,” originally created for the Miguel Contreras Learning Complex, a high school just west of downtown L.A., and which commemorates Contreras’ legacy as a labor leader. The central figure in this mural is Karina Perez Alvarado, a Contreras and UCLA alum. A budding artist, Alvarado met Baca as a high school senior and showed her some sketches. Baca urged Alvarado to enroll in her class once the young woman got to UCLA. Alvarado did that, making it to UCLA despite many personal challenges. Now she is back at Contreras working as a teacher’s aide. Her visage in cap and gown hangs larger-than-life in the school cafeteria. It now serves as an opportunity for her to encourage teenagers from her community. Judy Baca, UCLA professor of Chicana and Chicano studies and art in the department of world arts and cultures/dance. UCLA professor Judy Baca and students at the Judith F. Baca Arts Academy in Watts. Teacher Lorena Valenzuela, Judy Baca and principal Tracye McWhorter. “Gente del Maiz” mural at the Judith F. Baca Arts Academy in Watts.